PRINCETON, NJ -- In light of the importance that child rearing has on gender roles in society and, ultimately, on families, workplaces, and the economy, Gallup recently asked Americans what they think is the ideal age for men and women to start having children. The majority, 58%, say 25 or younger is ideal for women, whereas the majority think men should start having children at 26 or older. Still, the average perceived ideal age for each gender to have children differs only slightly: 25 for women and 27 for men. The results are based on an Aug. 22-31 Gallup survey, in which 5,100 national adults were asked a number of questions about having children. Americans mention a wide spectrum of ideal ages for each gender, ranging from about 18 to 35 years of age for women and 18 to 45 for men. 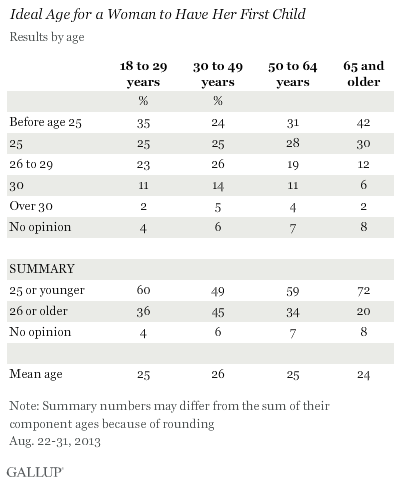 Here are some key differences in Americans' views on the ideal age to have a child by group. For more detailed results by key demographic groups, see page 2. 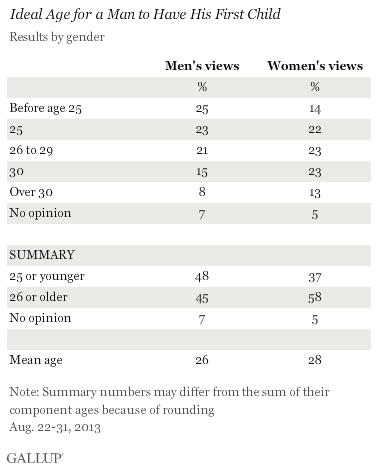 Men and women agree that women should start fairly young. Men and women largely agree that women should start having children by age 25; however, women are slightly more likely than men to consider the ages of 30 and older ideal: 17% vs. 13%. Ideal age of fatherhood skews slightly older, particularly among women. Men and women view the ideal age for men to become fathers somewhat differently, with the majority of women, 58%, saying that age is 26 or older. 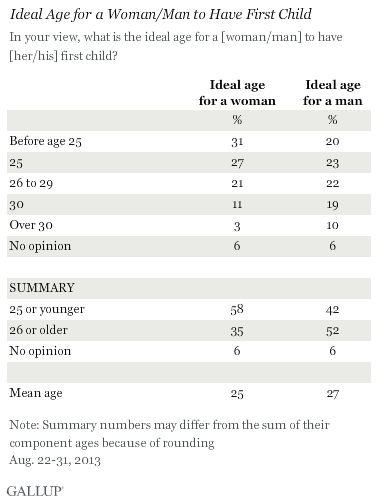 Men, on the other hand are equally split between those saying the ideal age for their gender is 25 or younger, and those saying it is 26 or older: 48% vs. 45%, respectively. 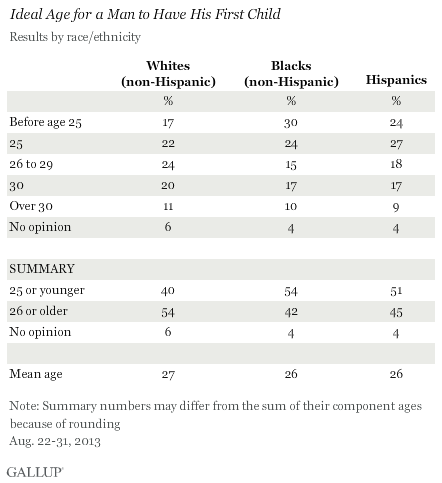 Blacks' and Hispanics' views on women's ideal age skew younger than whites'. Majorities of U.S. whites, blacks, and Hispanics believe the ideal time for a woman to have her first child is by age 25. 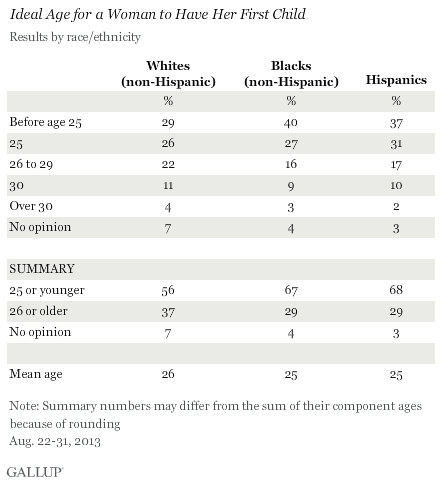 However, the proportion saying so is greater among blacks (67%) and Hispanics (68%) than among whites (56%). Whites also cite older ideal age for men. Similarly, Gallup finds racial and ethnic differences in views about men's ideal age to begin fatherhood, with blacks and Hispanics more likely than whites to cite 25 or younger as ideal. In this case, the contrast is starker because the majority of whites think it's best for a man to have his first child after age 25, whereas the majority of blacks and Hispanics think the ideal age is 25 or younger. Preference for delayed parenthood increases sharply with education. Some of the sharpest differences in views toward women's ideal age for becoming a mother are by education level. 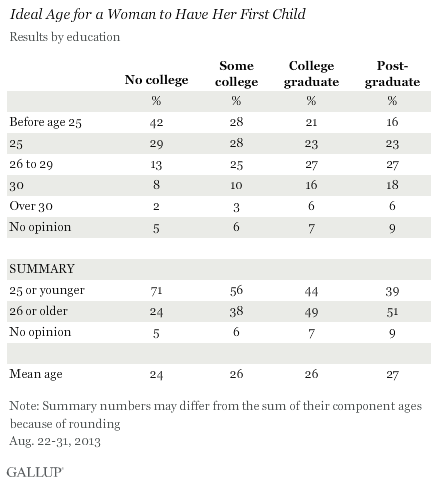 Americans with higher levels of education are more likely than those with little or no college to believe women should wait until age 26 or older to have children. Middle-aged show highest preference for women's delaying parenting. The view that women should start having children before age 25 is not highly correlated with age. While adults 65 and older are the most likely to say women should start having children before they are 25 (72%), solid majorities of adults aged 18 to 29 (60%) and 50 to 64 (59%) also say this. 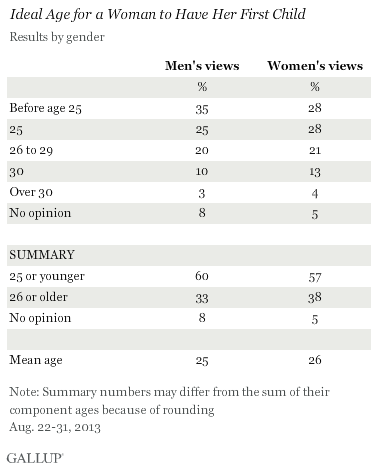 Those least likely to believe women should start that young are those aged 30 to 49, at 49%. Some medical experts say the best age for a woman to have a child is in her late teens or early 20s, because that is when she has the best odds of conceiving a healthy child. However, that doesn't square with modern Western sensibilities about pursuing higher education and career goals, finding the perfect partner, or simply relishing the experience of young adulthood. Given this tension between biology and societal norms, the decision about when to start having children is a highly personal one. Hence, Americans give a wide range of answers when asked what the ideal age is for women -- and, separately, men -- to have their first child. Overall, Americans tend to believe the ideal age to have one's first child is a bit younger for women than it is for men. That likely reflects the greater relevance of women's biological clock when it comes to childbearing. However, on average, the mid-20s is seen as the ideal age for both genders. And, in line with previous Gallup research showing that young adults' interest in having children remains high even as the U.S. fertility rate has declined, it is notable that 18- to 29-year-olds are nearly as likely as seniors to believe it is ideal for women to have their first child before 25. More generally, Gallup finds significant differences by education and race in Americans' views about the ideal age for becoming a parent. These could have important implications for fertility rates and, therefore, social trends, among various racial and educational groups in the U.S. Results for this Gallup poll are based on telephone interviews conducted Aug. 22-31, 2013, with a random sample of 5,100 adults, aged 18 and older, living in all 50 U.S. states and the District of Columbia. Economy Would Benefit if Marriage Rate Increases in U.S.
Americans who are married spend more money than those who are not, suggesting a positive impact on the U.S. economy if the marriage rate rebounds in the years ahead. Desire for Children Still Norm in U.S.
Americans are as likely to have or want children as they were in recent decades, even as the U.S. birthrate has dropped over the past few years. Financial concerns top the list of reasons adults think couples don't have more children.